﻿ X. Make a short summary of the text. X. Make a short summary of the text. Read the text bellow to grasp the main information. The first bridges were simply supported by beams, such as flat stones or tree trunks laid across a stream. For valleys and other wider channels—especially in East Asia and South America, where examples can still be found—ropes made of various grasses and vines tied together were hung in suspension for single-file crossing. Materials were free and abundant, and there were few labour costs, since the work was done by slaves, soldiers, or natives who used the bridges in daily life. Some of the earliest known bridges are called clapper bridges (from Latin claperius, "pile of stones"). These bridges were built with long, thin slabs of stone to make a beam-type deck and with large rocks or blocklike piles of stones for piers. Postbridge in Devon, Eng., an early medieval clapper bridge, is an oft-visited example of this old type, which was common in much of the world, especially China. The Romans began organized bridge building to help their military campaigns. Engineers and skilled workmen formed guilds that were dispatched throughout the empire, and these guilds spread and exchanged building ideas and principles. The Romans also discovered a natural cement, called pozzolana, which they used for piers in rivers. Roman bridges are famous for using the circular arch form, which allowed for spans much longer than stone beams and for bridges of more permanence than wood. Where several arches were necessary for longer bridges, the building of strong piers was critical. This was a prob­lem when the piers could not be built on rock, as in a wide river with a soft bed. To solve this dilemma, the Romans developed the cofferdam, a temporary enclosure made from wooden piles driven into the riverbed to make a sheath, which was often sealed with clay. Concrete was then poured into the water within the ring of piles. Although most surviving Roman bridges were built on rock, the Sant'Angelo Bridge in Rome stands on cofferdam foundations built in the Tiber River more than 1,800 years ago. Asian cantilever and arch bridges. In Asia, wooden cantilever bridges were popular. The basic design used piles driven into the riverbed and old boats filled with stones sunk between them to make cofferdam-like foundations. When the highest of the stone-filled boats reached above the low-water level, layers of logs were crisscrossed in such a way that, as they rose in height, they jutted farther out toward the adjacent piers. At the top, the Y-shaped, cantilevering piers were joined by long tree trunks. By crisscrossing the logs, the builders allowed water to pass through the piers, offering less resistance to floods than with a solid design. In this respect, these designs presaged some of the advantages of the early iron bridges. In parts of China many bridges had to stand in the spongy silt of river valleys. 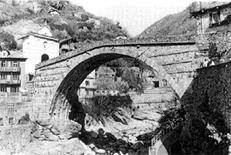 As these bridges were subject to an unpredictable assortment of tension and compression, the Chinese created a flexible masonry-arch bridge. Using thin, curved slabs of stone, the bridges yielded to considerable deformation before failure. I. Decide whether the following statements are true or false according to the text. IX. Put the different types of questions to the text. Look at the text title and complete the sentences according to their possible occurrence in the text. Translate from Russian into English using the vocabulary from the text. Using the key words defined in the previous exercise shortly describe each type of joints.